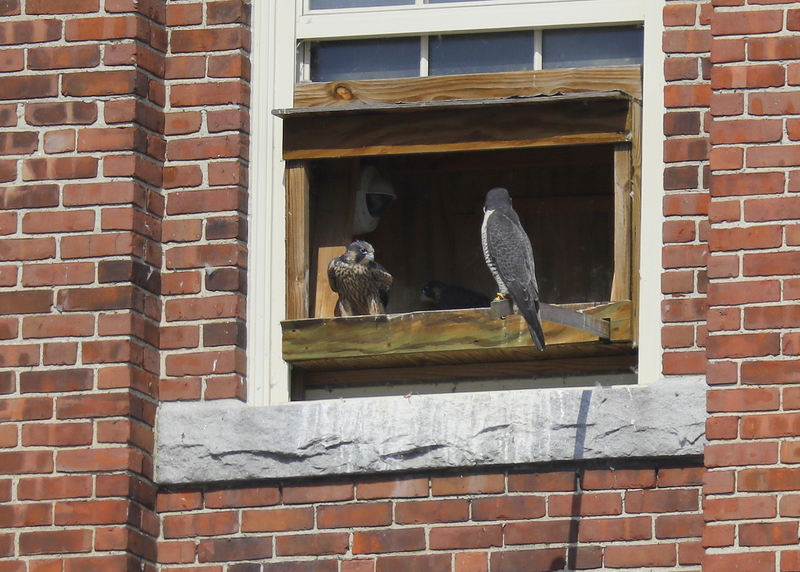 You are browsing the Blog for Peregrine Falcons Massachusetts. 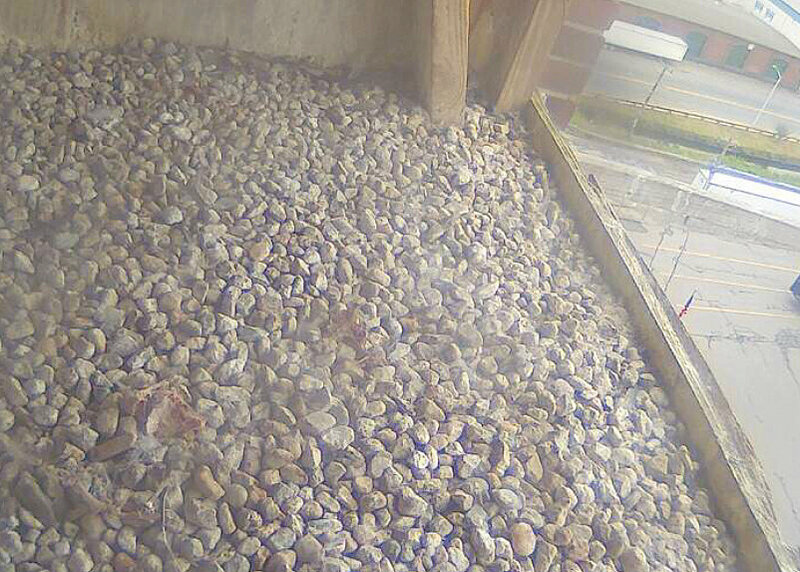 After many visits in and around the Clock Tower and many looks through the web cam, including earlier today, what a nice surprise to check in this afternoon and find the first egg laid for 2019! 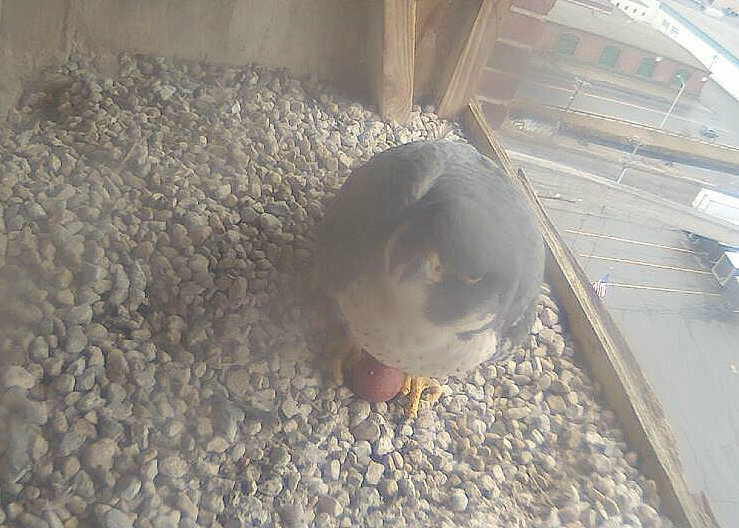 Finally after waiting and waiting, the female laid her first egg this today!. 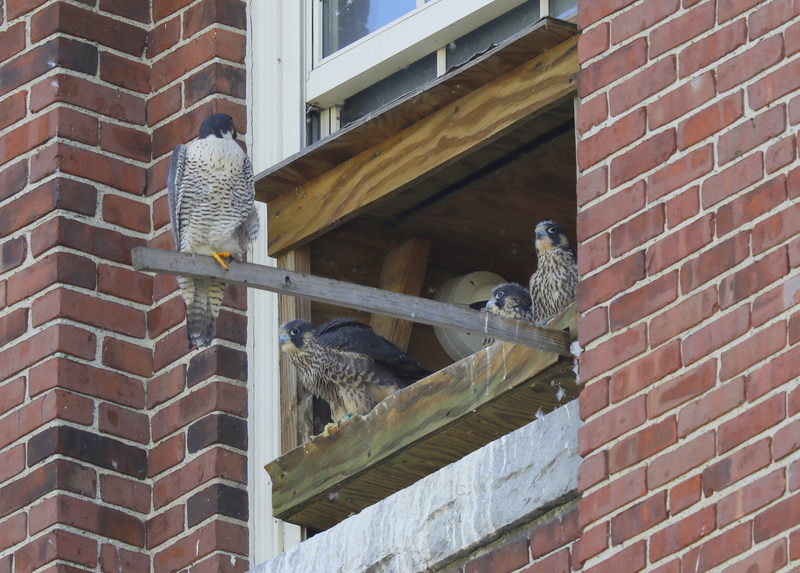 Her behavior was very consistent with the general lethargy that a female falcon typically experiences in the few days prior to laying the first egg. In many cases this lethargy may last a week or longer. 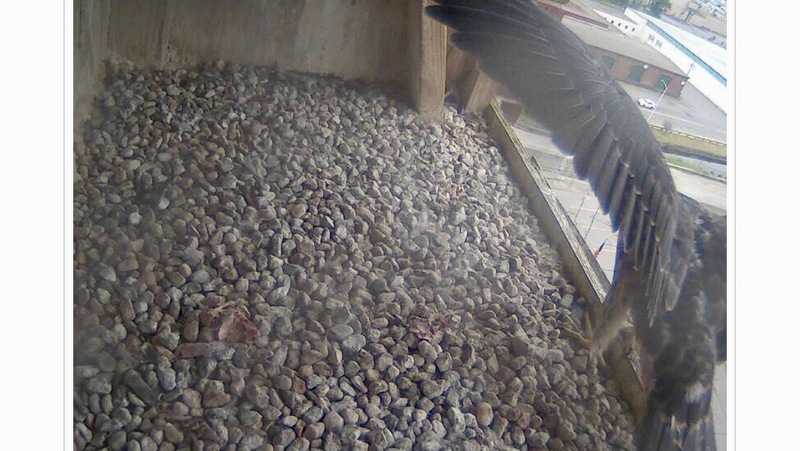 She lazes around and spends lots of time in the nest box, nest scraping, and other courtship related activities. 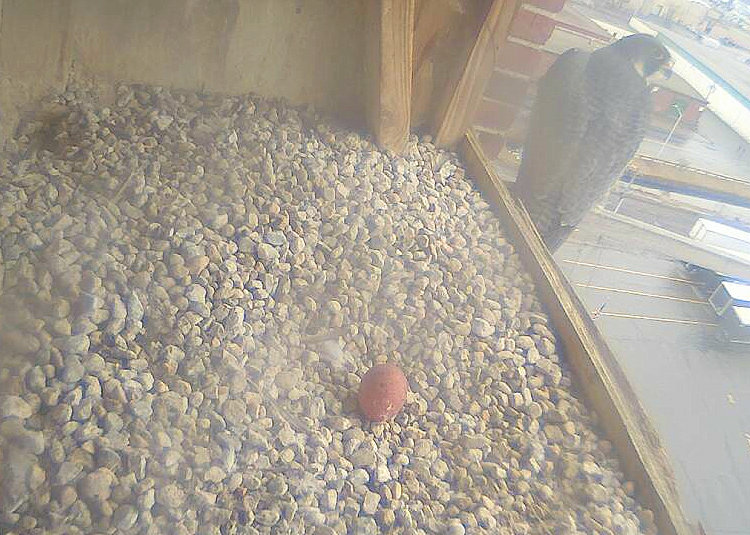 Incubation usually will not begin until the second to last egg has been laid. 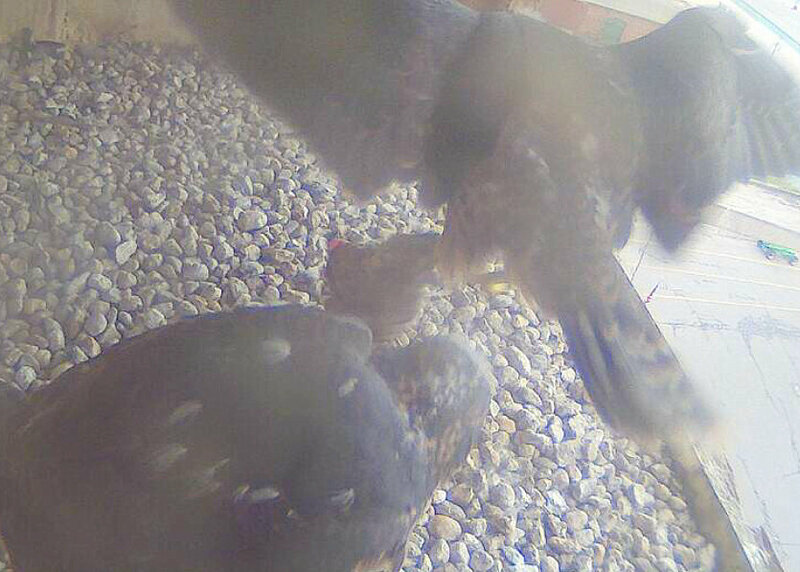 In this cool spring weather, with night time temps in the low 30’s, the female will spend some time incubating the egg, but it may not be a non-stop effort! 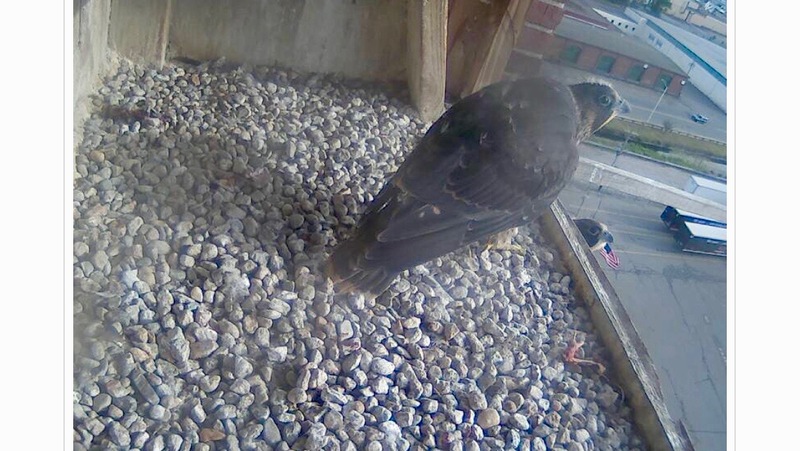 The female has a silver federal leg band on her right leg; and a black over green 38/BV band on her left leg. 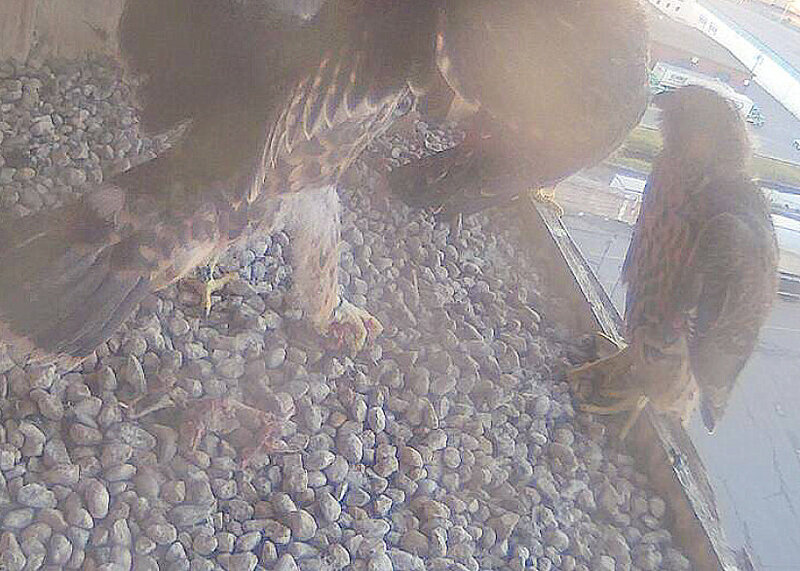 The male has only a silver right leg band and no band on his left leg. 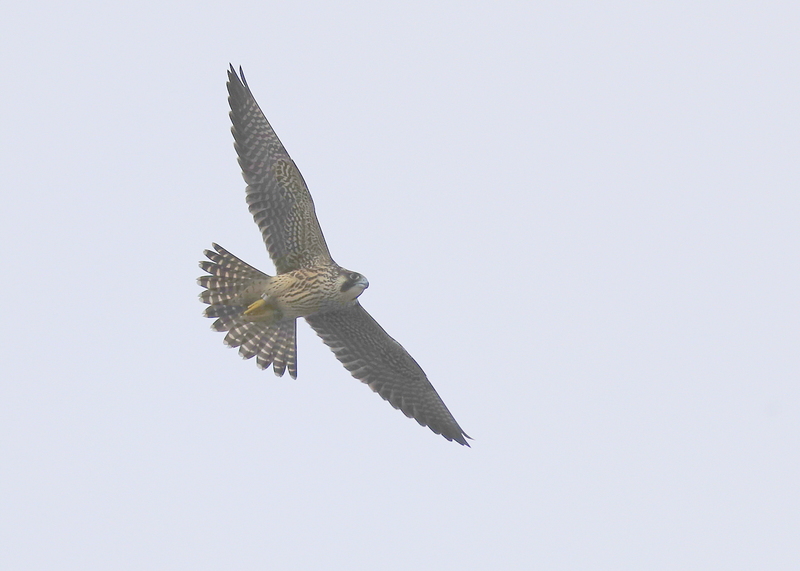 Fledgling in flight; adult female perched nearby! Made a visit to the Clock Tower this afternoon under mostly cloudy skies, winds from SW at 10MPH, and temp at 94F. Very little action around the area. 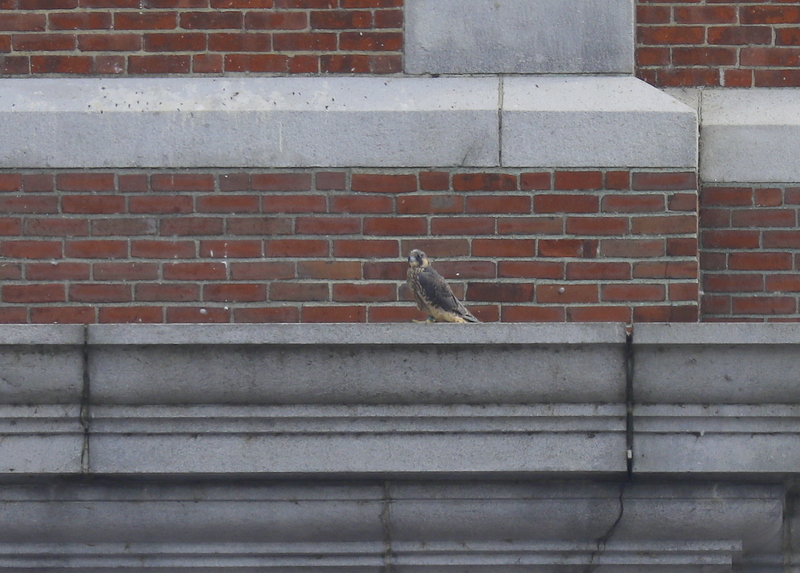 With binocs, made a scan and observed one young falcon atop the tall smokestack on opposite side of the Merrimack River by 250 Canal Street complex. Then, made a closer look at the distant Verizon Cell Tower at the corner of Hampshire and Canal Streets. 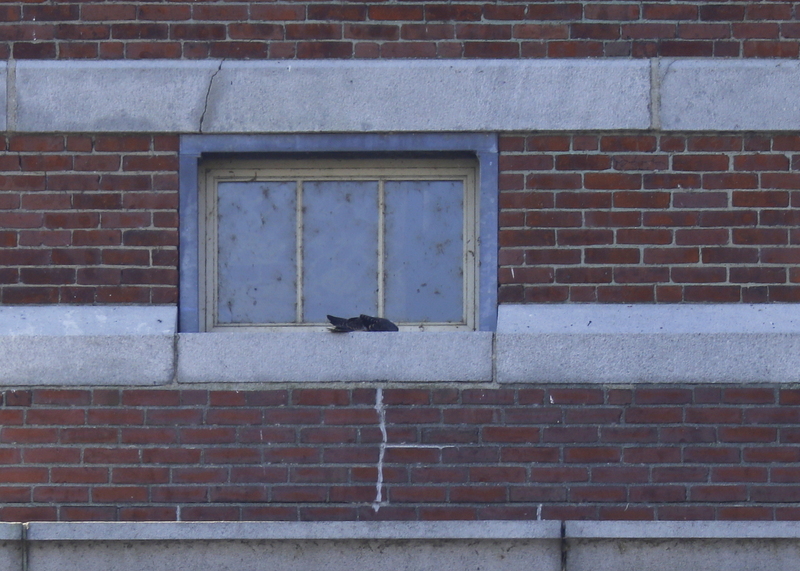 The adult female was perched on the east side of the cell tower on a lower cross bar. Her black/green leg band was barely visible. 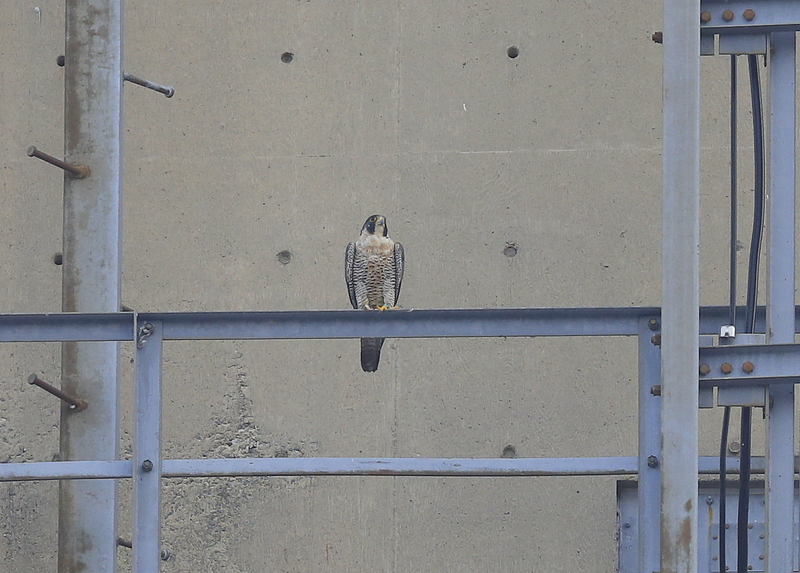 One of the juveniles was perched up much higher on the north side of the Cell Tower. Moved around to the west side of the Tower for a better look with just a bit more light. 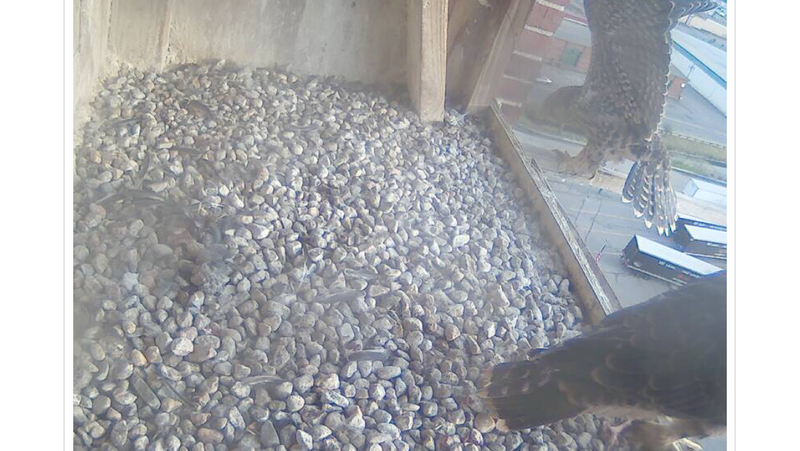 The young falcon spread its wings and departed in a downward stoop in pursuit of something just out of sight and returned a few minutes later. It then made many loops in flight around the tower and landed. Clock Tower: fledgling off balance! Made a visit to the Clock Tower later this afternoon under clear skies, bright sun, wind from SW at 12MPH, and temp at 94F. 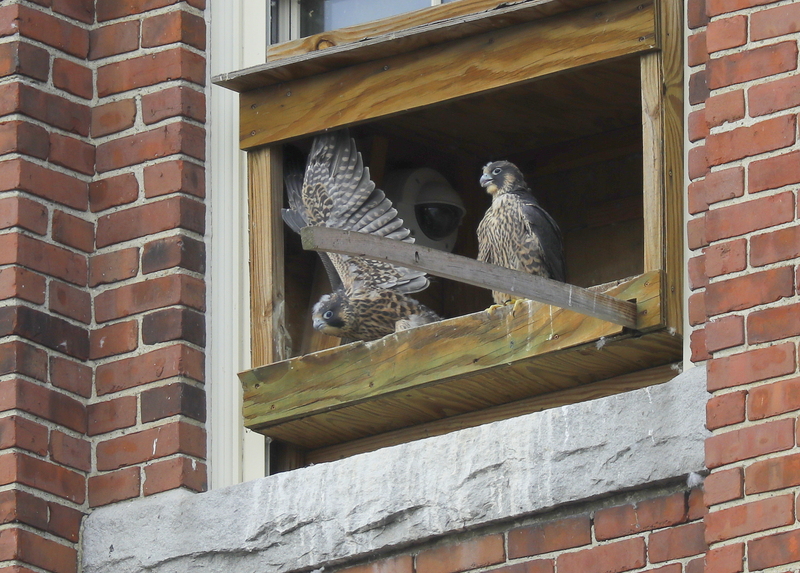 Both adults were seen perched and in flight around the Clock Tower. 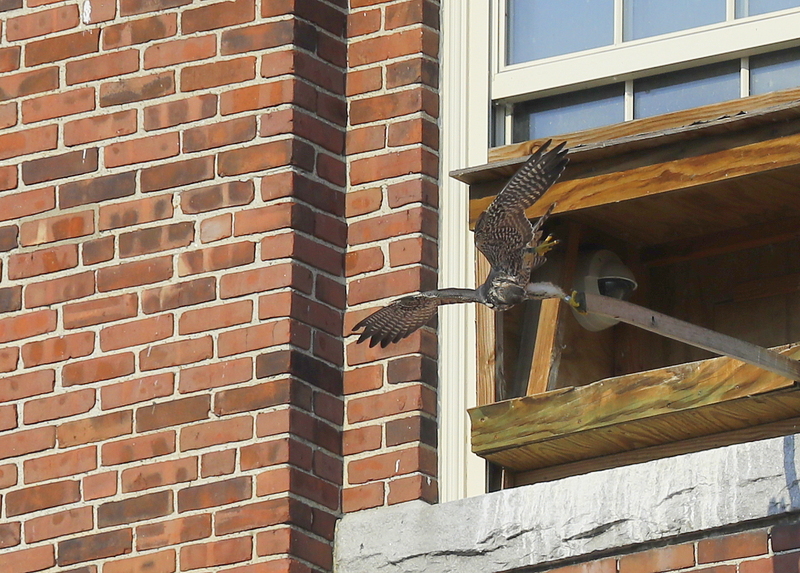 One of the juveniles was perched for a while on the rood below the weathervane, and then launched into flight, circled a few times, and then landed on the nest box perch pole. It was a bit challenged maintaining balance, and tuned around a few times. Then, when ready to depart, it made a few awkward steps and lost its balance, falling into flight! 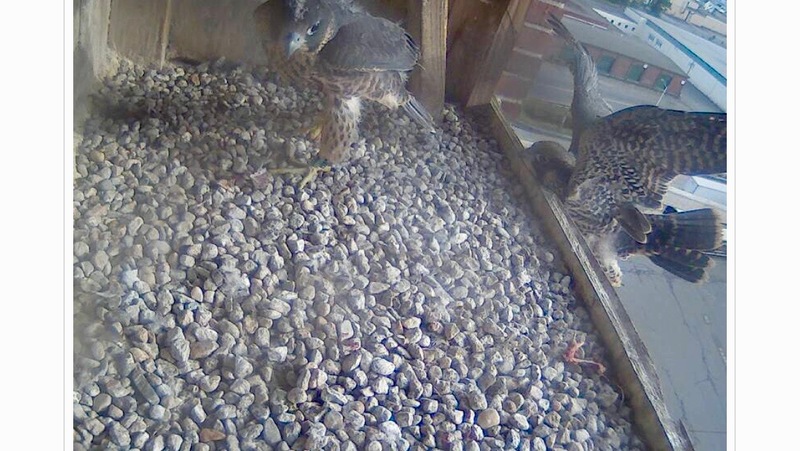 Amusing to watch and a reminder that the youngsters are still learning their flight and safe landing lessons!